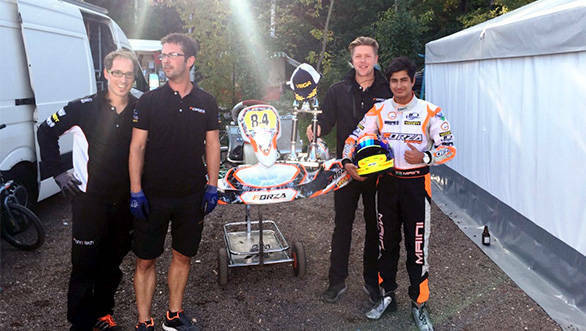 Kush Maini, finished second in his KF (senior class) debut at the 2015 German Karting Championship (Deutsche Kart Meisterschaft) that was held at the Kerpen circuit. The weekend began with Maini qualifying fifth, 0.133s behind the leader. After the heats, he managed to secure sixth place on the grid for the finals. The final race didn't start too well with Maini losing two places. However, he managed to regain these positions as the race progressed and at one point, overtook three karts in one lap within a few corners, pushing him to second place. Unfortunately, a competitor flipped his kart in the same lap, which called for a red flag. The rules stated that the order for a restart was decided according to the drivers' positions in the previous lap. This meant Kush had to start from fifth with just a few laps left. Undeterred, Maini made his way back up to second after the restart, finishing right behind the leader. He managed to set a lap time of 43.395s, which was the fastest by almost 0.2s. After the final race, Kush had said, "I'd like to thank my team, Forza Racing, who gave me a near perfect kart to work with. I tried my best to make a move on the last lap but I couldn't make it stick and had to settle for second. That being said, I'm quite happy with my KF (senior class) debut. I've never raced in Germany before, so to come here and get a podium straight away is quite a good result." Maini will now take part in the third round of the JK Tyre National Racing Championship in the JKFB02 series before heading to Italy for the WSK Final Cup. 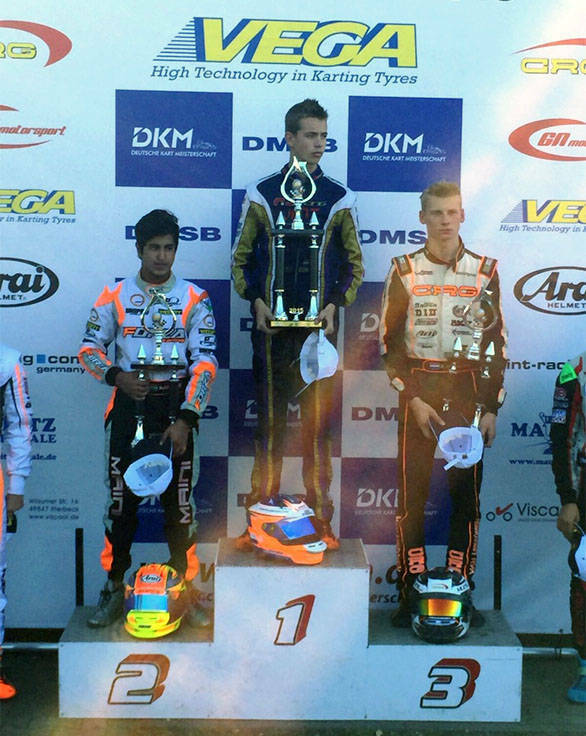 Kush Maini (14) stole the show at the final round of the German Karting Championship (DKM), which was conducted this past weekend at the Kerpen circuit in Germany. The event was the first time Kush competed in Germany and also marked the youngster's foray into the senior class of karting. The KF class is open to anyone above the age of 15 and is often contested by veterans with more than 10 years of karting experience. Coming to the race at hand, the youngster's weekend began with a bang when he qualified 5th overall with a time of 43.375 seconds which was a mere .133 seconds off the leader. He followed this up with some great racing in the heats to eventually manage a 6th place starting position in the finals. The finals however did not start well at all, with Kush losing two positions at the start that saw him drop down to 8th, undeterred by this, the youngster displayed a maturity beyond his years and patiently worked his way up the order. One of the more memorable instances was when he managed to overtake 3 karts in one lap going from 5th to 2nd in the space of a few corners. However disaster struck, when on the same lap one of his competitors flipped his kart while fighting for position and the ensuing melee was severe enough to warrant a red flag. This meant all of Kush's work was undone as the rules state that in an instance where the red flag comes out, the order of the race for the restart is counted as per the previous lap. By implementing this rule, Kush had to restart the race in 5th and had only a handful of laps to try and make it back up the order. With that in mind the talented teenager who very recently celebrated his 15th birthday blitzed his way through the field and was quickly back in second place. He began chasing down the leader who had by this time pulled out a small but significant lead and was on his bumper by the last lap of the race. Kush tried making a move on the leader, but the man in first used his experience to the fullest and managed to hold off Kush and win by the smallest of margins. Kush also managed to set the fastest lap of the race with a time of 43.395 seconds that was almost a full two tenths quicker than anyone else on the grid. When asked about his race, a delighted Kush said, "First of all I'd like to thank my team, Forza Racing who gave me a near perfect kart to work with. I tried my best to make a move on the last lap but I couldn't make it stick and had to settle for second, that being said I'm quite happy with KF (senior class) debut, I've never raced in Germany before so to come here and get a podium straight away is quite a good result." Kush will now focus his attention on the J.K.Tyre Formula BMW championship before switching his attention to the WSK Final Cup in Adria, Italy, which is scheduled in November.